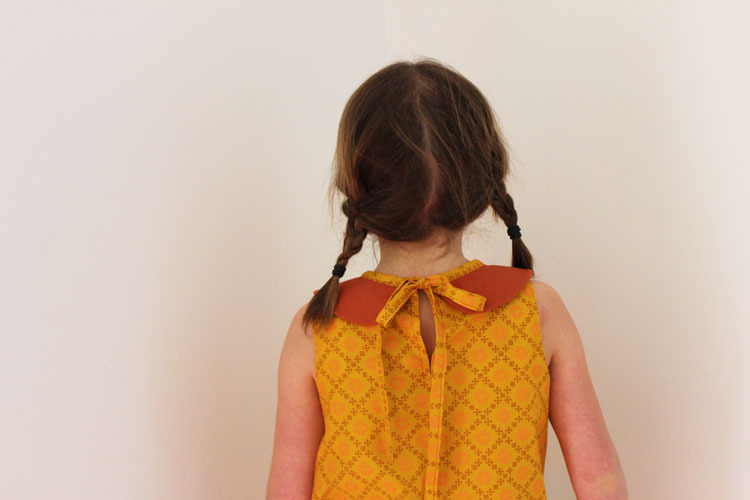 Jill and I had wanted to try a large peter pan collar with the Juliette during testing but got too busy so decided to add it as a free piece that you can use instead of the ruffle. I was eager to see how the collar looked with the bias neckline and I love how it turned out - especially with the ties option at the back. 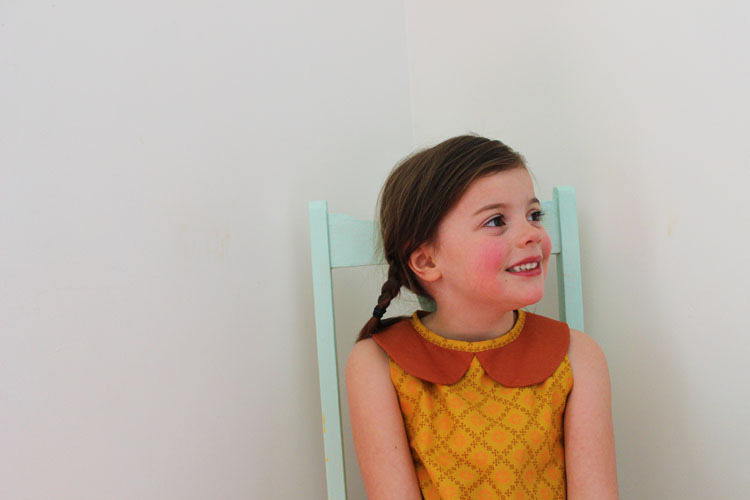 Would you like to try the Juliette collar with your Juliette pattern? You can find the file in the sewpony patterns group HERE. Just look in the 'files' section of the group and there you will find the free Dulcie dress and now also the Juliette collar. I made this dress from a beautifully soft cotton is called Woodland Clearing, designed by Leisl Gibson (the genius behind Oliver + S patterns) for Robert Kaufmann. I bought it a Ministry of Fabric a few months ago. I love the pops of neon pink (which are a little hard to see in these pics)...and of course you know I love mustard. I made the collar from some medium brown homespun I picked up at Spotlight. I wanted the collar to sit beyond the arm scyes, because I love when they do that! We tried in vain to take some photos of Emily down at an awesome cafe by the water near us but it was too cold and she couldn't stop shivering! Naughty Mummy. So we opted for some sewing room photos instead. Emily is very hard to photograph as she is constantly pulling funny faces so I end up taking forty photos to achieve five that I can use! Have you read about the Dressed in sewpony sewing contest? I really hope you can join in!! 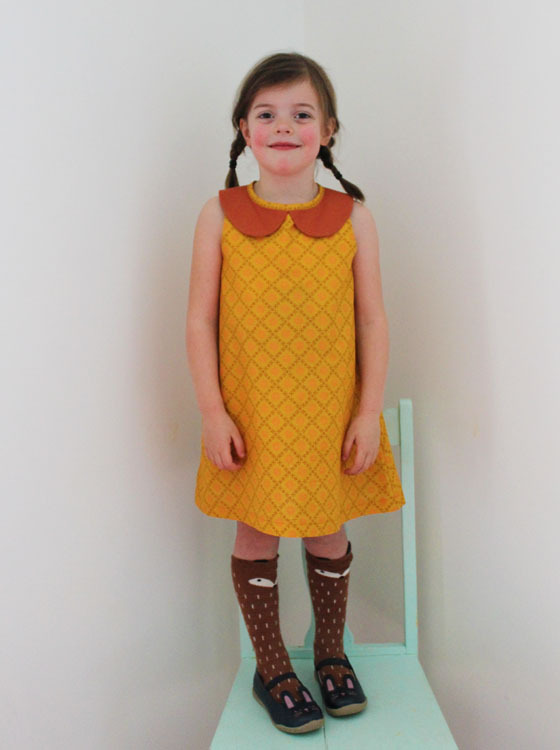 There are so many great prizes to be won and all you need to do is sew up a sewpony dress!! You can read all about it HERE! 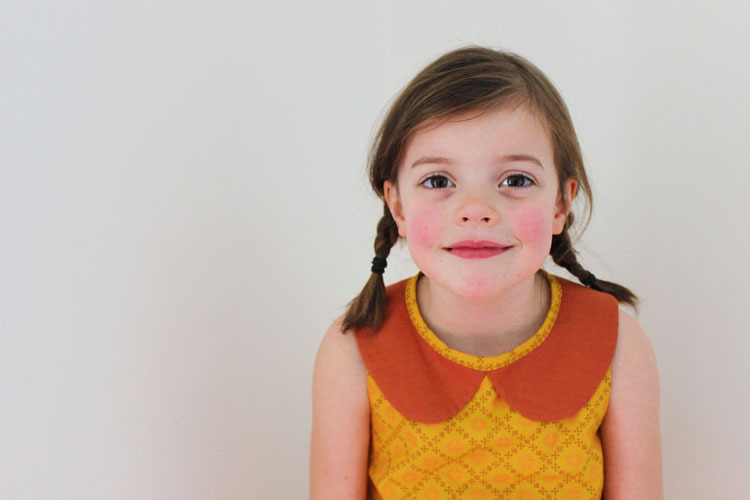 Come back in a few hours for the beginning of the Juliette dress + top pattern tour!! Pssst..... you can subscribe to sewpony HERE. I love it! 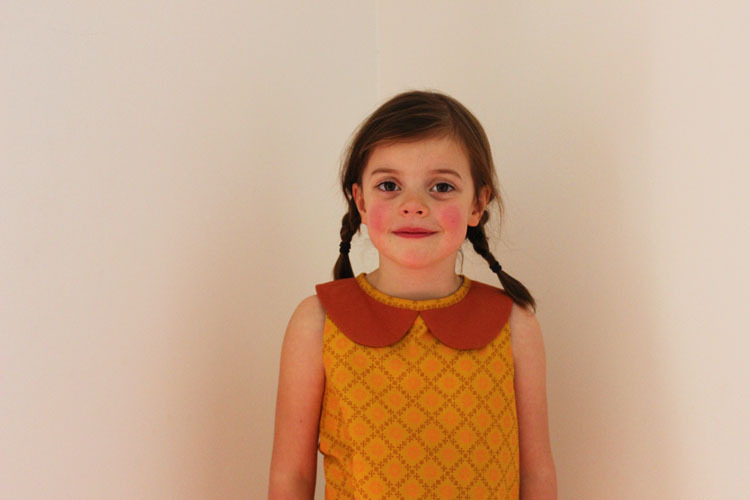 Thanks Suz and Jill for this great pattern piece and the Juliette pattern in general! Thanks Marjolein! Your sewing is amazing! Such stunning colours Suz. And Emily is so gorgeous!